The price of bitcoin dropped by 25% to $368.13 at 08:51am UTC today after peaking at $492.40 yesterday at 13:19pm (UTC). The final US Marshals auction of 44,000 bitcoins confiscated during the investigation into online black market Silk Road drew just 11 bidders today. The chief of the International Monetary Fund told a group of bankers this week that they don't have much to fear from bitcoin. The post Developer Readies Bitcoin-Based Voting Machine For 2016 Election appeared first on CCN: Financial Bitcoin & Cryptocurrency News. ProtonMail is shut down for more than a day by an epic DDoS said to have taken out a number of other Swiss companies. The attackers want $7,000 in Bitcoin, otherwise they'll continue blasting the firm with data. Are Blocks Filling up, and Is That a Problem? With the recent spike in bitcoin's exchange rate, there has been a surge in transaction volume on the Bitcoin network, too. And while most in the Bitcoin community welcome the significant uptrend, some have also expressed concern. This might be the first “Bitcoin boom” to be influenced by the 1 megabyte maximum block size, which limits the number of possible transactions on the network to about three per second. Bitcoin XT developer Mike Hearn, in particular, predicted in May of this year that a new hype-cycle could lead to full blocks, rising fees, increased confirmation times, a bulging memory pool, nodes dropping of the network, more attempted double spends, and ultimately, users leaving Bitcoin for good. So how are we doing so far? Blocks are filling up, or at least some of them are. The number of transactions on the Bitcoin network has roughly doubled over the past weeks, which has resulted in an average block size of about 700 kilobytes (0.7 megabyte). That is still below the maximum of 1 megabyte, but that is to be expected; for various reasons some miners produce some of their blocks well below the maximum capacity. The average transaction fee has been relatively stable over the past weeks. However, this is mostly because users (or their wallets) refrain from paying a higher fee, even though that would shorten the time for their transaction to confirm. Unfortunately, statistics on the average fee required to have a transaction confirmed in the very next block are currently unavailable. But over the past week the average fee required to have a transaction included in the next two blocks has increased from 140 bits to about 200 bits. Average confirmation times have increased quite a bit. Transactions were previously included in blocks within some 12 minutes on average. At the height of the price spike, transactions took an average of about 30 minutes to confirm. Is the memory pool building up? Well, not to problematic levels, that is. Of course, the memory pool – consisting of unconfirmed transactions waiting to be included in a block – is building up in between blocks. That is how Bitcoin is designed, and happens regardless of how full blocks are. But so far, the memory pool has not been building up to unusual levels, and has been much larger in the past. Are nodes dropping of the network? On average, there are no nodes dropping of the network. Over the past week, the number of full nodes has been stable at around 5,500. And this number has even risen a bit over the past couple of days. Unfortunately, there are no reliable statistics available concerning the amount of attempted double spends by users who believe their transactions take too long to confirm. The only statistics that come close concern the number of failed transactions. These appear to be very high, but that is mainly because of the ongoing transaction malleability attack. As such, the statistics on actual double spends are skewed, and cannot be trusted. While it is practically impossible to know for sure whether some users are disappointed in Bitcoin's performance and leave completely, it seems unlikely for now. Save for a slight increase of confirmation times (or required fees), Bitcoin is performing quite well. Moreover, v olume on exchanges is huge and, based on the increased exchange rate, it seems fair to assume that more new users want to get in rather than out. Despite some alarming forum posts, tweets and other reports, the spike in bitcoin's exchange rate has so far not caused any serious capacity problems for the Bitcoin network. Of course, this does not disprove Hearn's theory, and does not in itself mean there is no reason for concern. If bitcoin's surge maintains, and if volume on the network continues to grow, this might still lead to complications at a later stage. But so far, all is well on Bitcoin's blockchain. Thanks to Blocktrail CTO Ruben de Vries for providing additional statistics. The post Are Blocks Filling up, and Is That a Problem? appeared first on Bitcoin Magazine. Overstock is ready for a real crisis. 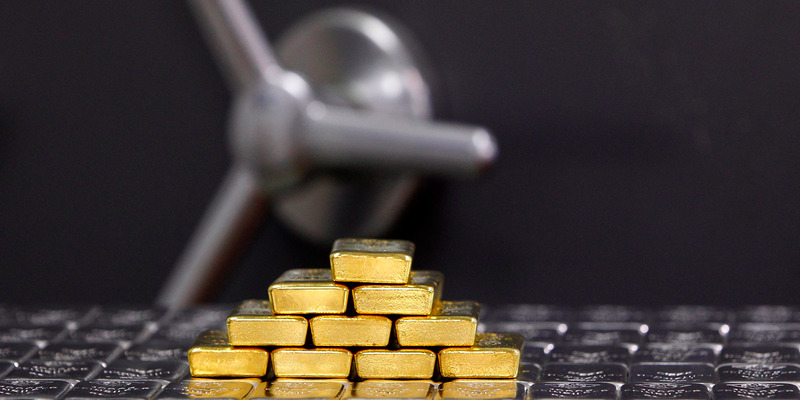 A report in The Financial Times on Thursday highlighted the online retailer's roughly $10 million of gold and silver — that is, physical gold and silver — it owns in case there's another crisis and the company needs to make payroll. Our precious metals consisted of $6.3 million in gold and $4.6 million in silver at June 30, 2015 and December 31, 2014. We store our precious metals at an off-site secure facility. Because these assets consist of actual precious metals, rather than financial instruments, we account for them as a cost method investment initially recorded at cost (including transaction fees) and then adjusted to the lower of cost or market based on an average unit cost. On an interim basis, we recognize decreases in the value of these assets caused by market declines ... We recorded a $52,000 loss on investments in precious metals for the three and six months ended June 30, 2015. There were no recorded gains or losses during the three and six months ended June 30, 2014. Again, we'd note that Overstock doesn't own ETFs or some other synthetic instrument that is a claim on gold or silver — which many people who diversify their investment portfolios by "owning some gold" end up doing (i.e., not actually owning gold) — the company instead owns the real thing. This is serious. As for why the company does this, Overstock chairman Jonathan Johnson told the FT, "We thought there's a decent chance that there could be a banking holiday at some point caused by a crisis and it could last for two days or two weeks or who knows how long, and we wanted to be in a position where we could continue to operate during any such crisis." Speaking to the United Precious Metals Association last month, Johnson added that the company also keeps 3 months of food for each employee on hand. So the company is not messing around: they are prepared for something bad to happen. Johnson told the FT, however, that he is not a "prepper." For folks that follow Overstock, however, this revelation may not come as a complete surprise, given that Overstock CEO Patrick Byrne has been one of the most outspoken advocates for bitcoin. Can Flexcaps Settle Bitcoin's Block Size Dispute? The block size dispute, perhaps the first ever real political controversy within the Bitcoin community, has raged for years, with no clear long-term solution in sight. Seven relevant BIPs (Bitcoin Improvement Proposals) have been submitted that could increase the maximum block size in order to allow for more transactions on the Bitcoin network, and alternative Bitcoin implementation Bitcoin XT is even attempting a blockchain fork to increase the limit. But none of the proposed solutions seem to be gathering enough support to establish a new consensus. And even if a consensus is to be found before the end of the year, as desired by prominent industry leaders, it will most likely be a temporary solution designed to win some time. However, there is some light at the end of the tunnel as far as long-term solutions go. So-called flexcaps, in particular, are favored by a significant segment of the development community. And at least one such a solution is submitted for consideration at the Scaling Bitcoin workshop in Hong Kong next month. What are flexcaps and why are they needed? Flexcaps are, as the name suggests, flexible caps on the block size. As opposed to hard limits – 1MB, 8MB, programmed growth, a voted maximum, etc. – flexcaps allow each block to vary in size, determined by the miner who mines the block. Specific limits are almost always politically unstable. No one loves the particular number, whether it's maximum immigration numbers, or limits on rent, or minimum wages... Even if people agree on the fundamentals of the trade-off, very few agree on the particular number that is set. The number stays where it is only because of constant political battling. In the case of Bitcoin, moreover, strict limits on the maximum block size don't handle boost activity well. Short periods of time where for whatever reason the number of transactions on the Bitcoin network rises significantly, might cause problems at each pre-set limit. In a post on Bitcointalk, mathematician and Bitcoin expert Meni Rosenfeld explained that he – like Bitcoin XT developer Mike Hearn – expects the Bitcoin network to crash if transactions systematically fill up blocks. But unlike Hearn, Rosenfeld believes the main problem is not so much the size of blocks themselves. Instead, Rosenfeld sees the fact that the Bitcoin network cannot handle full blocks all too well as the real problem, which is why he suggested a flexcap (“elastic cap”), too. The proposed solution, therefore, is to allow miners to increase the limit on blocks they mine – but at a cost. By effectively charging miners for the creation of bigger blocks, there is an incentive for these miners to keep blocks smaller. Meanwhile, miners have the option to scrape up additional mining fees by (temporarily) creating bigger blocks. If the additional fees are worth more that the additional cost, it makes sense to increase size of a particular block. These opposing incentives should result in a balance, a block size that is acceptable to developers, miners, users, and other network participants – at least in theory. Flexcaps can be realized in several ways, with no fundamental difference between the different approaches. Whether to use one or the other is mostly a matter of personal preference, and it seems unlikely to cause great controversy. Maxwell's flexcap design has a similar goal as Rosenfeld's: increasing the cost of creating bigger blocks – but achieves it in a different manner. Rather than cutting into the block reward, Maxwell's flexcap design requires miners to mine at a higher difficulty level. If a miner wants to a create block 10 percent bigger than the norm, it needs to “pay” for that by mining the block at an increased difficulty, in effect needing to invest more energy (hence, money) on hashing. It should be noted that neither solution would really solve the problem of over-sized blocks. They would, however, counter one possible attack on the Bitcoin network. Since bigger blocks favor bigger miners (presumably pools), any block size policy that allows miners to increase the block size incentivises big miners to do so; in effect centralizing the mining ecosystem. This includes any policy where the block size is adjusted on the basis of previous blocks, since miners can send themselves transactions for free, allowing them to create artifically big blocks and game the system. Because flexcaps include a cost to increase the block size, the system cannot be gamed for free. After all, even if miners send themselves transactions, they still need to pay the flexcap “fine” for increasing the block size. It should be noted, however, that one remaining attack would be an “investment attack.” Big miners with deep enough pockets could pay the price for increasing the block size over a long period of time, simply to get rid of smaller competitors in order to gain a larger profit later on. While unlikely, this might still be a profitable strategy. Flexcaps will not completely remove the need for limits on the block size. Most importantly, they still require a default maximum, above which a miner is “fined” one way or another. So how are these limits set? One such solution is submitted to be presented at the Scaling Bitcoin workshop in Hong Kong by Bitcoin Core developer Mark Friedenbach. Friedenbach's proposal uses a play on Rosenfeld's rollover fee system, but with an added advantage for miners who prefer to create smaller blocks – which, among other advantages, could counter an investment attack. Rather than simply gift the foregone subsidy to some future miner, the flexcap proposal I am working on would require the future miner to constrain the block they are working on to a smaller size in order to claim the held funds. If a miner creates a slightly larger block by claiming only 24 bitcoin, the next miner can create a slightly smaller block and claim 26 bitcoin. In Friedenbach’s proposal, the default block limit is based on the size of previous blocks. While the parameters of this proposal are not set in stone yet, the network might take the median block size of the past two weeks, and set that number as the default limit for the next two weeks. In an ideal scenario, the limits and – perhaps more importantly – parameters used in a flexcap solution follow more or less naturally from experimentation and testing. However, the fact that limits or parameters need to be selected by humans means it still involves some level of politics. Rather than removing politics completely, flexcap proponents hope that this solution could allow the Bitcoin network to release some steam when under pressure. This could solve the problem of oversaturation to great extent, which in turn might prevent the debate itself from overheating as much as it did in the past. The post Can Flexcaps Settle Bitcoin's Block Size Dispute? appeared first on Bitcoin Magazine. Smart contracts, a feature of “Bitcoin 2.0” technologies such as Ethereum, could soon operate on the Internet of Things (IoT), control objects in the physical world, and power a new decentralized version of the sharing economy, for example sharing services similar to Uber and Airbnb that operate in pure P2P mode without centralized management. Smart contracts represent a disruptive innovation with a huge potential. In 2001, legendary cryptographer Nick Szabo spoke of smart contracts that solved the problem of trust by being self-executing and having property embedded with information about who owns it. For example, the key to a car might operate only if the car has been paid for according to the terms of a contract. Now Slock.it, a German startup specialized in blockchain and IoT applications, is moving to realize Szabo’s vision of smart contracts embedded in IoT-enabled devices. The company will sell smart locks linked to the Ethereum blockchain. “If you can lock it, we will let you rent, sell or share it,” promises the company’s website. International Business Times notes that smart-lock technology could decentralize the sharing economy, empowering anyone to easily rent, share or sell anything that can be locked, which means disrupting the disruptors, including companies such as Airbnb and other intermediaries based around some form of physical access. “I use [Uber and Airbnb] and appreciate the progress they are making in bringing awareness to the sharing economy, but I would prefer a system that would allow me to deal directly with the owner without any third parties skimming off the top,” says Jentzsch. Smart locks could also control access to cars, bicycles and storage units. While bicycles and storage units are ideal initial use cases, unlikely to present too many regulatory obstacles, cars with smart locks for access control are a potentially disruptive use case that could threaten the business model of Uber and Zipcar. Cars could be parked in city roads waiting for the next customer, located with a phone app, rented by the hour and unlocked with the app by “paying the lock” in the Ethereum blockchain, used, and parked again. Around 2020, rental cars with smart locks could be also self-driving and pick up new customers autonomously. It’s evident that these innovations could radically change city life. Jentzsch is scheduled to unveil more information in a talk at Ethereum’s Developer Conference, DEVCON , in London on Thursday, November 12. The post Slock.it to Introduce Smart Locks Linked to Smart Ethereum Contracts, Decentralize the Sharing Economy appeared first on Bitcoin Magazine. Watch out – there’s a fake LocalBitcoins app being distributed on the Google Play store. Two-time auction winner Tim Draper has revealed to CoinDesk that he is not participating in today’s auction of more than 44,000 BTC. The US Marshals Service is auctioning off the remaining 44,000 BTC confiscated from Ross Ulbricht during the Silk Road investigation today. House prices in the south-east and east of England will jump by more than a fifth over the next five years, as growth ripples out of London into the capital’s hinterland, but will remain subdued in much of the rest of the UK, according to estate agency Savills. Savills predicts that the average UK house price will rise by 5% next year, but then slip back to 2.5%-3% a year until 2020, as tighter mortgage criteria and rising interest rates hold back home buyers. Its figures suggest that the average UK home will go up in price from £205,000 today to around £240,000 in 2020. JP Morgan CEO Jamie Dimon has issued new remarks about bitcoin, dismissing the digital currency's potential to survive in the long-term. The post China's New National Economic Plan Seeks Innovation appeared first on CCN: Financial Bitcoin & Cryptocurrency News. The post Bitcoin Bandits Hit Atlanta Smoke Shop to Flee With Bitcoin ATM appeared first on CCN: Financial Bitcoin & Cryptocurrency News.